Click here to play iCivics’ game Do I Have a Right? in English or Spanish. Post your final score on Twitter or Facebook with #Democracy at Play. Tag 2 or more of your friends and challenge them to beat your score. The reward? A refresher on our shared rights - and, of course, bragging rights. 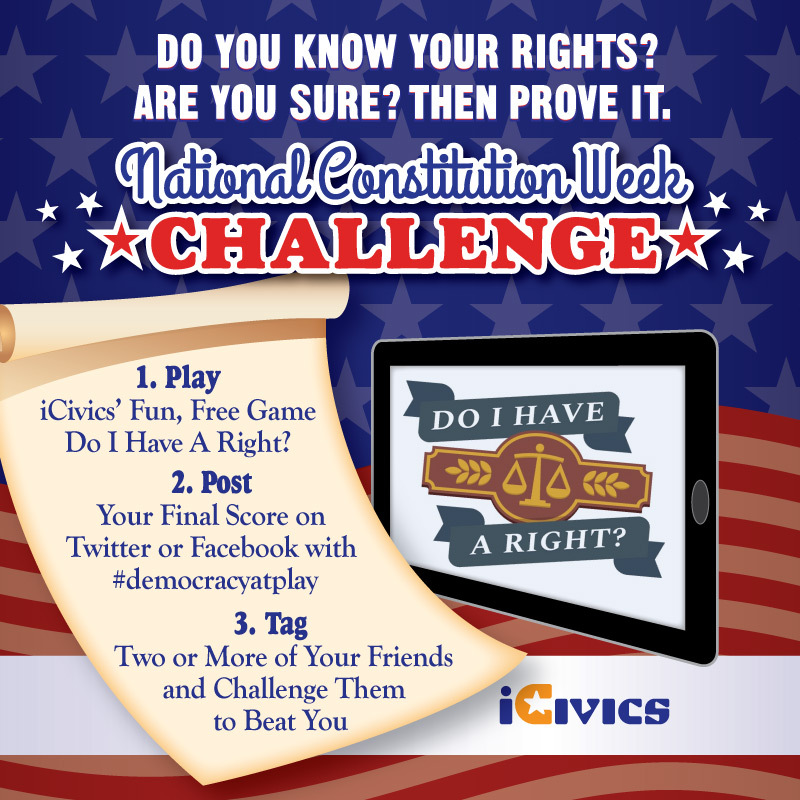 The Constitution Day Challenge is part of the iCivics Democracy At Play campaign. The campaign was designed to enable conversations about civics and politics between parents and their kids in a fun, informative, and engaging way. In an effort to reach Spanish-speaking families, materials are available in both English and Spanish. Interested in hosting a game challenge event? It's a great way to get people in your community together and encourage civic engagement, brush up on civic knowledge and promote civility. Everything you need to host your FREE event can be found here (in English or Spanish). Questions? 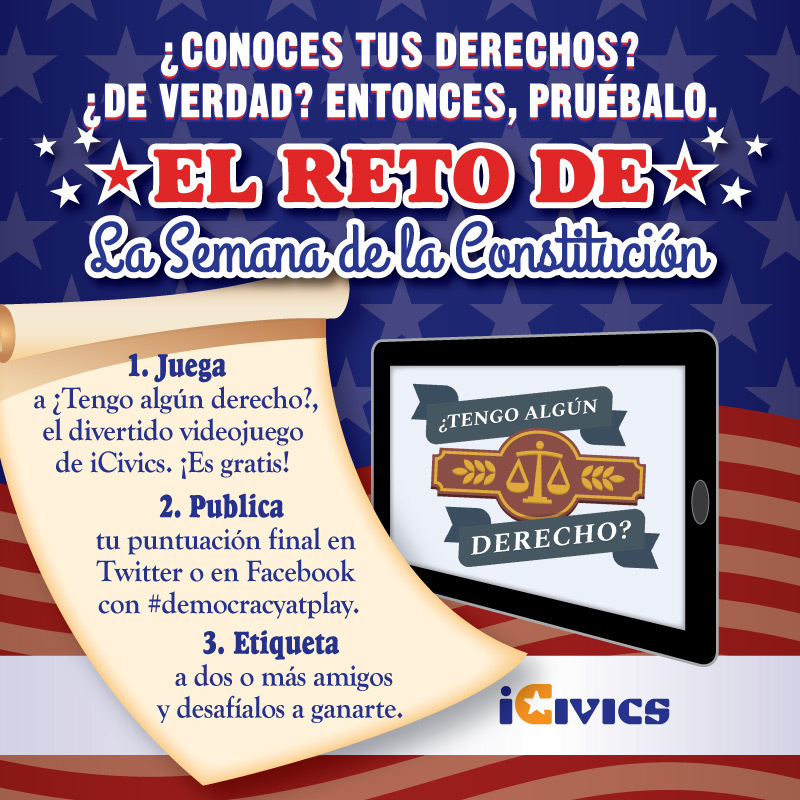 Email challenge@icivics.org. Compatriotas, aprovechando que es la semana de la Constitución... ¡elevemos nuestro juego a otro nivel! La Constitución es el corazón de la democracia, pero ¿realmente conoces los derechos que garantiza? Vamos a averiguarlo. Te retamos a demostrar tus conocimientos. Es fácil, divertido y GRATIS. Simplemente haz clic aquí para jugar al videojuego de iCivics ¿Tengo algún derecho? Publica tu puntuación final en Twitter o Facebook con #Democracy at Play y etiqueta a 2 o más de tus amigos. Desafíalos a ganarte.